Mill Creek Vista Park construction site. Photo credit: Richard Van Winkle. A new three-building, 31,000 square foot commercial development called Mill Creek Vista Park will begin construction at 9th Avenue SE on a 4.64 acre undeveloped lot south of 164th Street SE early in 2016. There will be 82 parking stalls located to minimize the sight impact of automobiles from the public street. 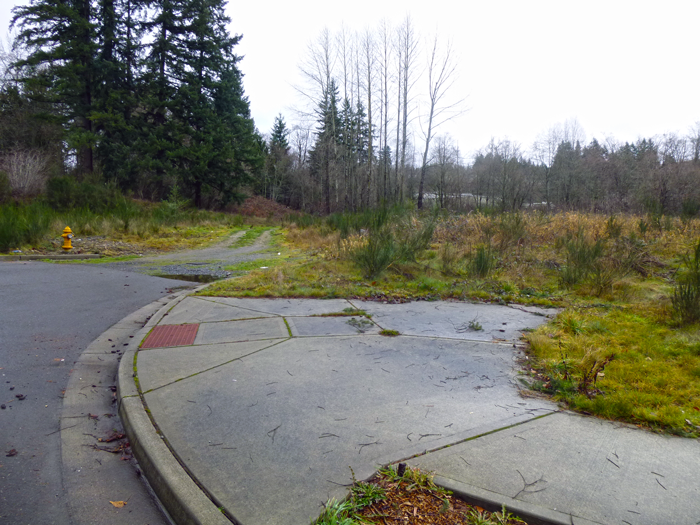 As well, a walking path will be constructed on the property that will connect 9th Avenue SE to the Bothell-Everett Highway (SR 527) via the adjoining Clock Tower Storage facility on Bothell-Everett Highway. It’s interesting to note that current Mill Creek City Councilmembers Mark Bond and Donna Michelson were members of the city council that approved the binding site plan over ten years ago. The Mill Creek City Council originally approved the Robinett and Cronin Binding Site Plan more than ten years ago on April 13, 2004. Robinett and Cronin, LLC, negotiated the development agreement and constructed full-width frontage improvements including a sidewalk and fire hydrant along 9th Avenue SE in anticipation of selling the property to a business owner who would construct the final development. They sold the property to Lori Blades in 2015. The site has been designed to have a low impact on the adjoining wetlands and Penny Creek. The final stormwater infiltration pond design will utilize on-site soil testing to verify the infiltration rate prior to construction as high groundwater in the area hinders stormwater absorption. Mill Creek Community and Economic Development Director Tom Rogers said in an email that a separate wetlands tract including the Penny Creek, the category II wetlands, and the category IV wetlands would be created when the final binding site plan is recorded.